Hi everybody, and welcome to a new Top Ten Tuesday! Today is all about those bookish resolutions. Now, I do love me some resolutions, but after my huge 2017 reading and blogging slumps, my major goal for 2018 is to take it easy. To avoid another slump at all costs. This means I am not taking part in any reading challenges yet, and am setting my Goodreads goal lower as well. And it is noticeable in my resolutions below. Other than my Goodreads goal, I’m keeping all of this kind of vague and balancing them with resolutions to not worry about those resolutions. It kind of makes sense though, I promise! In 2016 I set my goal at 60 books and easily surpassed it with about 12 books. In 2017 I set my goal a bit higher at 75 books and hardly got to 60 because of a major reading slump. And even if this was only a number, it demotivated me to have Goodreads remind me I was behind schedule. So in 2018 I’m taking it a bit easier and putting my goal back at 60. Still a nice goal to reach for, but less stressful. Isn’t this always a major goal for most bookworms? I mean, I’d love to keep up with new releases, but what I’d love more is to get some of those older books of my list, the ones I’ve been talking about starting forever already. I’m thinking about pretty much all the books from last week’s Top Ten Tuesday, but rest assured there are more where those came from. I don’t do this enough. I tend to rely on other bloggers and reviewers so much when it comes to picking up a book to the point where I won’t even pick up a book at the store if the title doesn’t ring a bell from a review or blog post. And I could be missing out on a lot of hidden gems that way. So the goal is to just go with the flow and if a book sounds like something for me I’ll just pick it up without having checked Goodreads. This is so important and I want to pay special mind to it this year. I want to read more diversely, but I mostly also want to pay more attention to supporting #ownvoices authors. I’ve been saying I want to do this for years now, though I’ve always been a bit worried about where to start. But fellow bloggers have already recommended quite a few nice graphic novels and mangas, and I just need to dive in. Any recommendations are of course still always welcome. And this goal goes kind of directly against the previous ones, and yet I feel like it’s the most important one: follow my mood. Meaning if the book I want to be reading does not fit any of the above categories, but I feel like reading it? I’ll just read it. Meaning if my backlist mostly consists of fantasy, but I want to be reading that new contemporary release? I will read that one. Meaning if I don’t want to be reading right now, but watch Netflix instead? I’ll watch Netflix. So mostly: no pushing myself. For me, the heart of blogging is commenting and bloghopping. But lately, I feel like I have to scramble just to get replies back to the people who comment on my posts and hardly get to bloghop and comment myself. And I feel so guilty about that, because reading all your posts inspires and motivates me. So in 2018, I’ll try to be better about bloghopping regularly! I tell myself this often, but it’s necessary to keep repeating it, because looking at those numbers is oh so tempting. But it’s also a surefire way tp get demotivated and burned out. I’m always gonna want more followers, more views, more likes, more comments, but I need to remember, that A) this is not a job but a hobby, B) I prefer to interact closely with a few followers than barely interact with a large following and C) I’m doing this for fun and numbers are too stressful and not what makes me happiest about blogging anyway. When it comes to reading AND blogging, this is the main rule for me for 2018. Reading and blogging is something I do for fun, and the moment it starts to feel like it isn’t bringing me joy, is the moment I need to take a step back and take a break, without guilt… This blog and sharing the love of books is what makes me happy and no matter what goals or resolutions I set for myself, what matters most is that it keeps on making me happy. 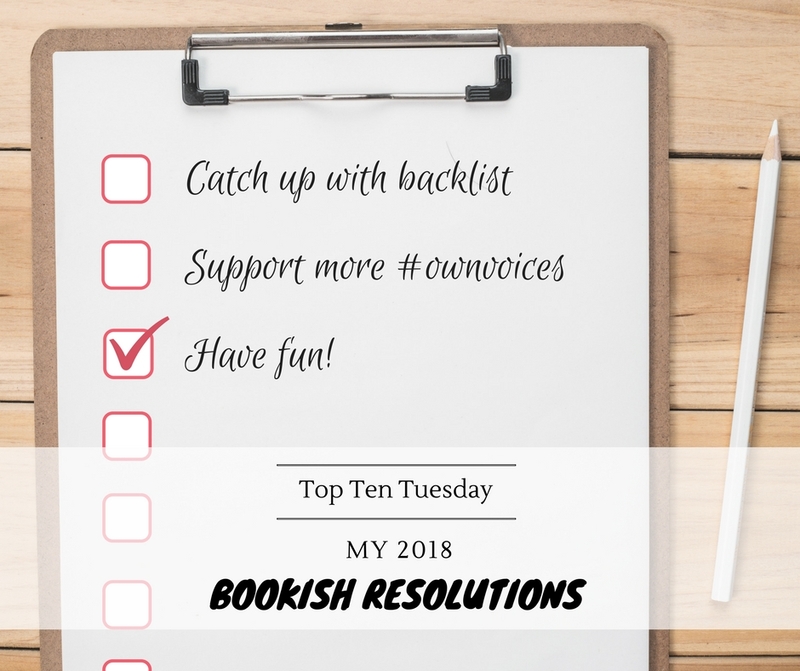 What are your bookish resolutions for 2018? Do we have some in common? Love your goals! I didn’t mention them on my T10T (going up in a little bit), but scheduling posts in advance more often is one of my major goals for 2018, too. What a fun list, Lindsey! Love that last one: HAVE FUN! That is so important in this blogging community. Getting things done more in advance AND picking up books on a whim are both things/places I’d like to find myself in for 2018 too. It makes the blogging life (and reading!) even more fun. Also, blog hopping. I love doing this, but don’t get around to it as often as I’d like. Perhaps 2018 will be the year we both accomplish this. Yes, it’s so easy to get caught up in everything and forget to have fun and I need to remind myself of that sometimes 🙂 And hopefully working more in advance will help with that and make the blog hopping easier as well 🙂 Thanks Rissi! I’m not doing any challenges either, at least not yet. It’s kinda nice to not have to worry about it! Picking up books on a whim is a great one- I want to do more of that as well. And read more graphic novels- I hardly read ANY last year! Good luck with your goals- I think having fun while doing this is the best part!! The one to pick up more book on a whim is a great resolution. It’s so easy to get caught up in what everyone else is reading and reviewing, and forget that you’ve got your own tastes and interests too. Definitely, especially since I started blogging I’ve been paying too much attention to blogger reviews and ratings and it’s a way to miss out on some possible hidden gems. I want to catch up on my backlist, too, so I joined a challenge that would help me with that. I need to stop worrying about the numbers, too. I compare myself to bigger bloggers all the time, and it can get me down. But when I think about it, I have more readers than I ever expected, so I should be proud of that! I did the Beat The Backlist challenge last year and had some fairly good results so I definitely think it’s a great way to catch up on the backlist! And you’re so right, it’s never a good thing to compare yourself to bigger bloggers. I love your blog and you should definitely be proud of what you’ve accomplished! I am SO with you on the backlist. That is my #1 goal of all goals this year!!! Also, we have very similar reading goals 🙂 It’s so nice to see someone who reads around 50-70 books per year. I feel like everyone else is always able to read 150ish and it makes me feel so slow. Happy 2018!! And good luck on your fabulous goals!! Yes that backlist always tends to get a little neglected, but no more! 🙂 Oh yes I totally relate to that! I’d love to be able to read over 100 books a year, but I’d rather keep it realistic for me and enjoy my reading 🙂 Thanks so much and happy 2018 to you too! Yay for Fun! That’s really what books and blogging should all be about 🙂 And I totally understand lowering your reading goal. I haven’t lowered mine so much as wiped it from existence lol – and so I’ve already reached my 2018 goodreads goal of one book! Huzzah! I just felt the pressure to read took away the joy – and it prevented me from doing so many other things like working on my own writing! I’ll have to check out Fruit Basket so thanks for the tip! Great goals Lindsey! I totally get you with the GR challenge, it is totally demotivating when it reminds you how behind you are. I always start with a goal much lower than what I actually expect to reach, then I can put it up through the year, I’ve found that’s worked really well for me the past few years and allows for slumps. I am also always trying to catch up on my backlist! Love your goals! Especially the last one – it echoes mine! Reading should be primarily fun for all of us. Good luck with them! And…have fun! I think having fun should be on everyone’s list. I mean, reading should be enjoyable. Great list! I’m hoping to keep on with my blogging planning habits, but… I can only plan one week in advance, I admire people able to plan out months in advance, that’s crazy hahaha. Yes, 60 books seems perfect for me, still challenging, but also realistic and not putting too much pressure on myself. If I don’t feel like reading one week, I won’t be too stressed about my goals 🙂 And ahh yes I admire bloggers who can schedule months in advance! I try and get to two weeks max and then I’m super proud of myself but then procrastinate on blogging afterwards so I end up having to scramble to get my posts written afterwards again anyway 🙂 But yes, it’s all about having fun most of all! Love these, i want to do more bloghopping too! My #1 goal is to re-read the Artemis Fowl series. Maybe one book a month in the series. There are only 8 books so I should be able to do it. Already re-read the first book this month so yay! That’s a fun goal and sounds doable as well 🙂 Good luck! I love the picking books up on a whim more often! I’m really terrible about this since I’m not really a mood reader so I tend to overschedule myself which cuts down on the fun. Great resolutions! Thanks! Overscheduling yourself definitely cuts down on the fun. Thanks, good luck with your goals too! It sounds like you’re set for a great year of reading! And until you mentioned it, I didn’t realize how much I’m in the same boat on “whim” books. Since I started seriously reading book blogs, I can’t think of something I’ve grabbed because it looked neat at the bookstore instead of because I’d seen it recommended somewhere. I used to LOVE scouring the shelves until something called out to me! Yes exactly! On one hand I discovered a lot of great books because of book blogging, but on the other hand I’m missing out on a lot of those “whim” books. Good luck with your goals. I`ve reduced my Goodreads goal for this year, just so I can focus on some big books.I also want to read more #ownvoices novels and I`m trying to keep up with at least 2-3 monthly new releases. Oh focusing on big books over lots of books is a great goal! I tend to shy away from big books because I think it’ll take too long and that’s a pity. Great goals! I love how many of them have to tie in with not stressing out and getting back to having fun with reading and blogging. Because that’s what it really should be about! Why is there such a need to make hobbies so competitive and anxious? I put my Goodreads goal very low (10 books) because I just wanted to focus on my own pace and not getting upset because I didn’t read more. Yes, exactly! I agree completely! Reading and blogging is something I do for fun, and it should stay fun. That’s a great idea to put your Goodreads goal at 10! Love your goals. I think the number one takeaway here is to have fun! I often have to remind myself of that when I worry about the numbers too much as well. Brilly post! I had the same exact experience with your #1 but I cheated – I lowered by goal during the last week in December! Same numbers too! For #5, I highly suggest Persepolis. True story in graphic novel about a girl growing up in Iran during the Islamic Revolution in the 70s. Awesome list! That’s a great idea actually, I should have done that too 🙂 Oh, I’ll check out Persepolis, thanks for the tip! I think the having fun aspect is one I have been missing from blogging in the last couple of months but I’m trying to get it back. These are all great resolutions, I hope they all work out for you! I missed you! Happy 2018! I love your list of goals – it makes perfect sense to me and I agree with them all! I’m making some changes myself and hopefully I’ll be a better reader and blogger because of it… But who knows!? The main goal is to relax and enjoy. I’ve also lowered my GR goal this year because it WAS awful to see how far behind I was all the time. And 2017 just started off on a bad foot by being behind so many books and then I never got to catch up really. I hope you manage to stick to your resolutions and I can’t wait to catch up a little with you soon. Thanks so much! I think I stressed a bit too much last year and that is partly what caused my slump so I’m definitely trying to take it more easy this year and relax and enjoy. It’s the most important thing, right?